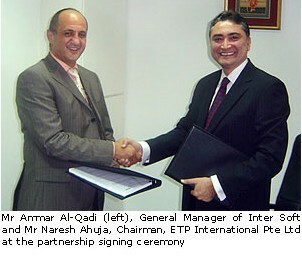 ETP International, an enterprise software company focused on developing and delivering its cutting-edge ETP V5.2 solution for the retail industry, with offices in Singapore, India and Dubai, announces the signing of a Premier Business Partnership agreement with Inter Soft. Inter Soft is a leading company that specialises in Retail, Hospitality and Banking Point of Sale Systems and their various sub-systems. Under the terms of the agreement, Inter Soft will represent ETP in the sales and marketing of its suite of solutions – ETP V5.2 which is developed specifically for the retail and distribution industry in Saudi Arabia. ETP V5.2 covers all the key functionalities required by retail and distribution companies. The integrated solution provides retailers and distributors the power to monitor and refine business strategies in response to the business dynamics instantly, effecting these changes in operations seamlessly without affecting day-to-day operations. The components within ETP V5.2 can be used comprehensively or selectively to provide an end-to-end integrated solution for retailers and distributors.Inter Soft is the first channel partner that ETP International has signed for Saudi Arabia and in the Middle East. Although it has a regional office in Dubai, ETP International plans to leverage on the market knowledge and cultural understanding of the local partner to open up the market in Saudi Arabia. “Inter Soft is entering a new phase in its business strategy. Where previously we were offering customers only point-of-sales solutions, we can now look at a holistic offering for our retail customers,” said Mr Ammar Al-Qai, General Manager of Inter Soft. The partnership was signed in Singapore and plans have been made to take the solution to market in Saudi Arabia. For a start, InterSoft will be launching ETP V5.2 in GITEX 2006 at its booth in the Sheikh Maktoum Hall and ETP will also be on hand to lend support from its booth under the Singapore Pavilion at the same event. 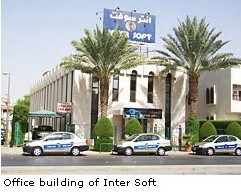 INTERSOFT, an International Company with its head quarters in Saudi Arabia was established in 1991 as a company specialized in Retail, Hospitality and Banking Point of Sale Systems and their various sub-systems. INTERSOFT has built a strong clientele testifying our creativity, commitment to quality and after sales service. Committed to providing immediate and after sale support for our customers across the region, currently INTERSOFT operates four offices, 3 in Saudi Arabia and 1 in United Arab Emirates.